There are reports of bird and bat mortality at wind turbines as there are around other artificial structures. The scale of the ecological impact remains unclear. Prevention and mitigation of wildlife fatalities, and protection of peat bogs, affect the siting and operation of wind turbines. Wind power consumes no water  for continuing operation, and has near negligible emissions directly related to its electricity production. Wind turbines when isolated from the electric grid produce negligible amounts of carbon dioxide, carbon monoxide, sulfur dioxide, nitrogen dioxide, mercury and radioactive waste when in operation, unlike fossil fuel sources and nuclear energy station fuel production, respectively. With the construction phase largely to blame, wind turbines emit slightly more particulate matter (PM), a form of air pollution, at an "exception" rate higher per unit of energy generated(kWh) than a fossil gas electricity station(" NGCC"),   and also emit more heavy metals and PM than nuclear stations, per unit of energy generated. As far as total pollution costs in economic terms, in a comprehensive 2006 European study, alpine Hydropower was found to exhibit the lowest external pollution, or externality, costs of all electricity generating systems, below 0.05 c €/ kWh. Wind power externality costs were found to be 0.09 - 0.12c€/kW, while nuclear energy had a 0.19 c€/kWh value and fossil fuels generated 1.6 - 5.8 c€/kWh of downstream costs. With the exception of the latter fossil fuels, these are negligible costs in comparison to the cost of electricity production, which is approximately 10 c €/ kWh in European countries. The Vattenfall utility company study found Hydroelectric, nuclear stations and wind turbines to have far less greenhouse emissions than other sources represented. The thermal efficiency of fossil-based power plants is reduced when operated at fluctuating and suboptimal loads to supplement wind power, which may degrade, to a certain extent, the GHG( Greenhouse gas) benefits resulting from the addition of wind to the grid. A study conducted by Pehnt and colleagues (2008)  reports that a moderate level of [grid] wind penetration (12%) would result in efficiency penalties of 3% to 8%, depending on the type of conventional power plant considered. Gross and colleagues (2006) report similar results, with efficiency penalties ranging from nearly 0% to 7% for up to 20% [of grid] wind penetration. Pehnt and colleagues (2008) conclude that the results of adding offshore wind power in Germany on the background power systems maintaining a level supply to the grid and providing enough reserve capacity amount to adding between 20 and 80 g CO2-eq/kWh to the life cycle GHG emissions profile of wind power. Turbines are not generally installed in urban areas. Buildings interfere with wind, turbines must be sited a safe distance ("setback") from residences in case of failure, and the value of land is high. There are a few notable exceptions to this. The WindShare ExPlace wind turbine was erected in December 2002, on the grounds of Exhibition Place, in Toronto, Ontario, Canada. It was the first wind turbine installed in a major North American urban city centre. Steel Winds also has a 20 MW urban project south of Buffalo, New York. Both of these projects are in urban locations, but benefit from being on uninhabited lake shore property. Use existing data on migratory and other movements of wildlife to develop predictive models of risk. Use new and emerging technologies, including radar, acoustics, and thermal imaging, to fill gaps in knowledge of wildlife movements. Wind facilities have attracted the most attention for impacts on iconic raptor species, including golden eagles. The Pine Tree Wind energy project near Tehachapi, California has one of the highest raptor mortality rates in the country; by 2012 at least eight golden eagles had been killed according to the U.S. Fish and Wildlife Service (USFWS). Biologists have noted that it is more important to avoid losses of large birds as they have lower breeding rates and can be more severely impacted by wind turbines in certain areas. Arctic terns and a wind turbine at the Eider Barrage in Germany. 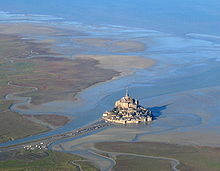 The surroundings of Mont Saint-Michel at low tide. While windy coasts are good locations for wind farms, aesthetic considerations may preclude such developments in order to preserve historic views of cultural sites. Aesthetic considerations of wind power stations have often a significant role in their evaluation process. To some, the perceived aesthetic aspects of wind power stations may conflict with the protection of historical sites. Wind power stations are less likely to be perceived negatively in urbanized and industrial regions. Aesthetic issues are subjective and some people find wind farms pleasant or see them as symbols of energy independence and local prosperity. While studies in Scotland predict wind farms will damage tourism,  in other countries some wind farms have themselves become tourist attractions,    with several having visitor centers at ground level or even observation decks atop turbine towers. In the 1980s, wind energy was being discussed as part of a soft energy path. 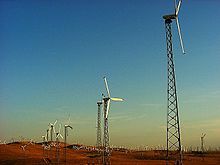 Renewable energy commercialization led to an increasing industrial image of wind power, which is being criticized by various stakeholders in the planning process, including nature protection associations. Newer wind farms have larger, more widely spaced turbines, and have a less cluttered appearance than older installations. Wind farms are often built on land that has already been impacted by land clearing and they coexist easily with other land uses. Traditional offshore wind turbines are attached to the seabed in shallower waters within the near-shore marine environment. As offshore wind technologies become more advanced, floating structures have begun to be used in deeper waters where more wind resources exist. Potential disruption of the near-field and far-field marine environments from large offshore wind projects. Due to the landscape protection status of large areas of the Wadden Sea, a major World Heritage Site with various national parks (e.g. Lower Saxon Wadden Sea National Park) German offshore installations are mostly restricted on areas outside the territorial waters. Offshore capacity in Germany is therefore way behind the British or Danish near coast installments, which face much lower restrictions. ^ Guezuraga, Begoña; Zauner, Rudolf; Pölz, Werner (2012). "Life cycle assessment of two different 2 MW class wind turbines". Renewable Energy. 37: 37–44. doi: 10.1016/j.renene.2011.05.008. ^ a b c "IPCC Working Group III – Mitigation of Climate Change, Annex II I: Technology – specific cost and performance parameters" (PDF). IPCC. 2014. p. 10. Archived from the original (PDF) on 16 June 2014. Retrieved 1 August 2014. ^ "IPCC Working Group III – Mitigation of Climate Change, Annex II Metrics and Methodology. p. 37–40, 41" (PDF). Archived from the original (PDF) on 2014-09-29. ^ Diesendorf, Mark. Why Australia Needs Wind Power, Dissent, Vol. No. 13, Summer 2003–04, pp. 43–48. ^ a b "Wind energy Frequently Asked Questions". British Wind Energy Association. Archived from the original on 2006-04-19. Retrieved 2006-04-21. ^ "How Much Noise Does a Wind Turbine Make?". 2014-08-03. ^ Gohlke, Julia M.; Hrynkow, Sharon H.; Portier, Christopher J. (2008). "Health, Economy, and Environment: Sustainable Energy Choices for a Nation". Environmental Health Perspectives. 116 (6): A236–7. doi: 10.1289/ehp.11602. PMC 2430245. PMID 18560493. ^ a b Loren D. Knopper, Christopher A. Ollson, Lindsay C. McCallum, Melissa L. Whitfield Aslund, Robert G. Berger, Kathleen Souweine, and Mary McDaniel, Wind Turbines and Human Health, [Frontiers of Public Health]. June 19, 2014; 2: 63. ^ a b Mikołajczak, J.; Borowski, S.; Marć-Pieńkowska, J.; Odrowąż-Sypniewska, G.; Bernacki, Z.; Siódmiak, J.; Szterk, P. (2013). "Preliminary studies on the reaction of growing geese (Anser anser f. Domestica) to the proximity of wind turbines". Polish Journal of Veterinary Sciences. 16 (4): 679–86. doi: 10.2478/pjvs-2013-0096. PMID 24597302. ^ a b Thomas Kirchhoff (2014): Energiewende und Landschaftsästhetik. Versachlichung ästhetischer Bewertungen von Energieanlagen durch Bezugnahme auf drei intersubjektive Landschaftsideale, in: Naturschutz und Landschaftsplanung 46 (1), 10–16. ^ Eilperin, Juliet; Steven Mufson (16 April 2009). "Renewable Energy's Environmental Paradox". The Washington Post. Retrieved 2009-04-17. ^ a b "Wind farms". Royal Society for the Protection of Birds. 14 September 2005. Retrieved 6 December 2012. ^ a b Kubiszewski, Ida; C. J. Cleveland; P. K. Endres (1 January 2010). "Meta-Analysis of Net Energy Return for Wind Power Systems". Renewable Energy. 35 (1): 218–225. doi: 10.1016/j.renene.2009.01.012. ^ Weißbach, D.; Ruprecht, G.; Huke, A.; Czerski, K.; Gottlieb, S.; Hussein, A. (2013). "Energy intensities, EROIs (energy returned on invested), and energy payback times of electricity generating power plants". Energy. 52: 210–21. doi: 10.1016/j.energy.2013.01.029. ^ Dailykos - GETTING TO ZERO: Is renewable energy economically viable? by Keith Pickering MON JUL 08, 2013 AT 04:30 AM PDT. ^ "Vestas: Comparing energy payback". Archived from the original on 2013-06-15. Retrieved 2013-05-05. ^ " Life cycle assessment of electricity produced from onshore sited wind power plants based on Vestas V82-1.65 MW turbines Archived 2014-12-04 at the Wayback Machine" page 4. Vestas, 29 December 2006. Accessed: 27 November 2014. ^ Wittrup, Sanne. " 6 MW vindmølle betaler sig energimæssigt tilbage 33 gange" English translation Ingeniøren, 26 November 2014. Accessed: 27 November 2014. ^ Mielke, Erik. Water Consumption of Energy Resource Extraction, Processing, and Conversion Harvard Kennedy School, October 2010. Accessed: 1 February 2011. ^ Hydropower-Internalised Costs and Externalised Benefits"; Frans H. Koch; International Energy Agency (IEA)-Implementing Agreement for Hydropower Technologies and Programmes; Ottawa, Ontario, Canada. p. 131–134, Figure 1. ^ White, S. W. (2007). "Net Energy Payback and CO2 Emissions from Three Midwestern Wind Farms: An Update". Natural Resources Research. 15 (4): 271–281. doi: 10.1007/s11053-007-9024-y. ^ a b Dolan, Stacey L.; Heath, Garvin A. (2012). "Life Cycle Greenhouse Gas Emissions of Utility-Scale Wind Power". Journal of Industrial Ecology. 16: S136–S154. doi: 10.1111/j.1530-9290.2012.00464.x. SSRN 2051326. ^ a b Pehnt, Martin; Oeser, Michael; Swider, Derk J. (2008). "Consequential environmental system analysis of expected offshore wind electricity production in Germany". Energy. 33 (5): 747–759. CiteSeerX 10.1.1.577.9201. doi: 10.1016/j.energy.2008.01.007. ^ "IPCC Working Group III – Mitigation of Climate Change, Annex II Metrics and Methodology. p. 37–40, 41" (PDF). Archived from the original (PDF) on 2015-09-08. ^ Breyer, Christian; Koskinen, Otto; Blechinger, Philipp (2015). "Profitable climate change mitigation: The case of greenhouse gas emission reduction benefits enabled by solar photovoltaic systems". Renewable and Sustainable Energy Reviews. 49: 610–628. doi: 10.1016/j.rser.2015.04.061. ^ Perry, Simon; Ed Douglas (29 January 2011). "In China, the true cost of Britain's clean, green wind power experiment: Pollution on a disastrous scale". London: Daily Mail. Retrieved 2011-03-02. ^ Hilsum, Lindsey (6 December 2009). "Chinese pay toxic price for a green world". London: The Sunday Times. Retrieved 2011-03-02. ^ Bradsher, Keith (26 December 2009). "Earth-Friendly Elements Are Mined Destructively". The New York Times. Retrieved 2011-03-02. ^ Biggs, Stuart (6 January 2011). "Rare Earths Leave Toxic Trail to Toyota Prius, Vestas Turbines". Bloomberg L.P. Retrieved 2011-03-02. ^ Ingebretsen, Mark. Developing greener, cheaper magnets Ames Laboratory. Accessed: 10 March 2011. ^ Biello, David (13 October 2010). "Rare Earths: Elemental Needs of the Clean-Energy Economy". Scientific American. Retrieved 2011-03-02. ^ Paul Denholm, Maureen Hand, Maddalena Jackson, and Sean Ong, Land-Use Requirements of Modern Wind Power Plants in the United States, National Renewable Energy Laboratory, NREL/TP-6A2-45834, Aug. 2009. ^ Prentice, Colin (19 December 2013). "Climate change poses serious threat to Britain's peat bogs". London: Imperial College London. Retrieved 2013-12-19. ^ Smith, Jo; et al. (5 September 2012). "Renewable energy: Avoid constructing wind farms on peat". Nature. 489 (7414): 33. Bibcode: 2012Natur.489Q..33S. doi: 10.1038/489033d. PMID 22955603. ^ Stevenson, Tony Struan (20 May 2009). "Bid to ban peatland wind farms comes under attack". Sunday Herald. newsquest (sunday herald) limited. Archived from the original on 27 June 2009. Retrieved 20 May 2009. ^ Statement of the Government of Brandenburg, Germany. ^ "Canada's First Urban Wind Turbine - Not Your Average Windmill". Toronto Hydro. 2006-02-06. Archived from the original on 2008-03-30. Retrieved 2008-04-11. ^ Skarin, Anna; Nellemann, Christian; Rönnegård, Lars; Sandström, Per; Lundqvist, Henrik (2015). "Wind farm construction impacts reindeer migration and movement corridors". Landscape Ecology. 30 (8): 1527–1540. doi: 10.1007/s10980-015-0210-8. ^ Zehnder and Warhaft, Alan and Zellman. "University Collaboration on Wind Energy" (PDF). Cornell University. Archived from the original (PDF) on 1 September 2011. Retrieved 17 August 2011. ^ a b c d e "… the study already tells you the numbers are very rough estimates that need to be improved. I even explicitly state this, as well, in the conclusion: ‘the rudimentary numbers presented here are intended to provoke further research and discussion,’ in the abstract ‘this paper should be respected as a preliminary assessment,’ and in the title of the study, which has the word ‘preliminary’ in it...you are correct that errors 1 and 2 are true..." Benjamin Sovacool, Benjamin Sovacool takes issue with Lorenzini’s criticism of his work, Atomic Insights website, 11 July 2013. ^ a b c d e f g h i j k l m n Sovacool, Benjamin K. (2013). "The avian benefits of wind energy: A 2009 update". Renewable Energy. 49: 19–24. doi: 10.1016/j.renene.2012.01.074. ^ "U.S. Fish & Wildlife Estimate of Bird Mortality Due to Wind Turbines" (PDF). Letter to the Department of the Interior. American Bird Conservancy. 22 March 2012. Retrieved 6 December 2012. ^ Smallwood, K. S. (2013). "Comparing bird and bat fatality-rate estimates among North American wind-energy projects". Wildlife Society Bulletin. 37: 19–33. doi: 10.1002/wsb.260. ^ Ruane, Laura (6 November 2008). "Newest Air Defense: Bird Dogs". USA Today. Retrieved 6 December 2012. ^ Contaminant Issues - Oil Field Waste Pits, U.S. Fish & Wildlife Service, U.S. Department of the Interior. Retrieved July 30, 2013. ^ Johns, Robert. Actions by Feds Cut Annual Bird Deaths in Oil and Gas Fields by Half, Saving Over One Million Birds From Grisly Death, Washington, D.C.: American Bird Conservancy, January 3, 2013. Retrieved July 30, 2013. ^ a b c d Bird, David Michael. The Bird Almanac: The Ultimate Guide to Essential Facts and Figures of the World's Birds, Key Porter Books, 1999, ISBN 155263003X, ISBN 978-1552630037. ^ North-Hager, Eddie. "Millions of Birds Perish at Communication Towers, USC Study Finds". University of Southern California. Retrieved 6 December 2012. ^ a b Foderaro, Lisa W. Researching Stop Signs in the Skies for Birds, May 14, 2014, p. A21 (New York edition), and May 13, 2014 online. Retrieved from nytimes.com on May 14, 2014. Quote: "In January, scientists concluded that, nationwide, 365 million to 988 million birds die annually after crashing into buildings and houses." ^ "Cats Indoors! The American Bird Conservancy's Campaign for Safer Birds and Cats". National Audubon Society. Retrieved 6 December 2012. ^ Angier, Natalie. , The New York Times, January 29, 2013, Retrieved January 30, 2013. ^ U.S. Cats Kill Up To 3.7 Billion Birds, 20.7 Billion Small Mammals Annually, Paris: Agence France-Presse, January 29, 2013. Retrieved from The Globe and Mail website, January 30, 2013. ^ UK's most powerful wind farm could power Paisley, British Wind Energy Association, January 2006. ^ a b Baerwald, Erin F; D'Amours, Genevieve H; Klug, Brandon J; Barclay, Robert MR (2008-08-26). "Barotrauma is a significant cause of bat fatalities at wind turbines". Current Biology. 18 (16): R695–R696. Bibcode: 1996CBio....6.1213A. doi: 10.1016/j.cub.2008.06.029. OCLC 252616082. PMID 18727900. Lay summary – CBC Radio - Quirks & Quarks (2008-09-20). Laysource includes audio podcast of interview with author. ^ Craig K.R. Willis; Robert M.R. Barclay; Justin G. Boyles; R. Mark Brigham; Virgil Brack Jr.; David L. Waldien; Jonathan Reichard (2010). "Bats are not birds and other problems with Sovacool's (2009) analysis of animal fatalities due to electricity generation". Energy Policy. 38 (4): 2067–2069. doi: 10.1016/j.enpol.2009.08.034. hdl: 2263/11581. ^ Lorenzini, Paul (April 30, 2013). "Nukes kill more birds than wind?". Atomic Insights. Retrieved 26 August 2013. ^ K. Shawn Smallwood, "Comparing bird and bat fatality-rate estimates among North American wind-energy projects", Wildlife Society Bulletin, 26 Mar. 2013. ^ a b Loss, Scott R.; Will, Tom; Marra, Peter P. (2013). "Estimates of bird collision mortality at wind facilities in the contiguous United States". Biological Conservation. 168: 201–9. doi: 10.1016/j.biocon.2013.10.007. ^ "Study: California Wind Power is the Worst For Wildlife, Chris Clarke, November 2013". Archived from the original on 2014-02-20. ^ Barclay, Robert; E. F. Baerwald; J.C. Gruver (2007). "Variation in bat and bird fatalities at wind energy facilities" (PDF). Canadian Journal of Zoology. 85 (3): 381–387. doi: 10.1139/Z07-011. Archived from the original (PDF) on 4 March 2016. Retrieved 6 December 2012. ^ Marris, Emma; Daemon Fairless (10 May 2007). "Wind farms' deadly reputation hard to shift". Nature. 447 (7141): 126. Bibcode: 2007Natur.447..126M. doi: 10.1038/447126a. PMID 17495894. Retrieved 28 June 2013. ^ a b Emma Marris; Daemon Fairless (10 May 2007). "Wind farms' deadly reputation hard to shift". Nature. 447 (7141): 126. Bibcode: 2007Natur.447..126M. doi: 10.1038/447126a. PMID 17495894. ^ J. Ryan Zimmerling, Andrea C. Pomeroy, Marc V. d'Entremont and Charles M. Francis, "Canadian estimate of bird mortality due to collisions and direct habitat loss associated with wind turbine developments", Avian Conservation & Ecology, 2013, v.8 n.2. ^ Sahagun, Louis (16 February 2012). "U.S. probes golden eagles' deaths at DWP wind farm". Los Angeles Times. Retrieved 6 December 2012. ^ Balogh, Anne L.; Ryder, Thomas B.; Marra, Peter P. (2011). "Population demography of Gray Catbirds in the Suburban Matrix: Sources, Sinks and Domestic Cats". Journal of Ornithology. 152 (3): 717–726. doi: 10.1007/s10336-011-0648-7. ^ Austen, Ian. Casualties of Toronto’s Urban Skies, The New York Times, October 28, 2012, p. A6. Retrieved online November 2, 2012. ^ Kennedy, Joe. Country Matters: City Birds Battered To Oblivion, Dublin, Ireland: Sunday Independent, November 4, 2012. Retrieved online, November 4, 2012. ^ Lomborg, Bjørn (2001). The Skeptical Environmentalist. New York City: Cambridge University Press. ^ Johnston, D; Haines (1957). "Analysis of Mass Bird Mortality in October, 1954". The Auk. 74 (4): 447–458. doi: 10.2307/4081744. JSTOR 4081744. Pearce-Higgins, J. W.; Stephen, L.; Langston, R. H. W.; Bainbridge, I. P.; Bullman, R. (2009). "The distribution of breeding birds around upland wind farms". Journal of Applied Ecology. doi: 10.1111/j.1365-2664.2009.01715.x. ^ Elliott, Valerie (28 January 2006). "Wind Farms Condemned As Eagles Fall Prey To Turbines". The Times. ^ McDermott, Matthew (2 May 2009). "Texas Wind Farm Uses NASA Radar to Prevent Bird Deaths". Treehugger. Retrieved 6 December 2012. ^ "Wind Turbines A Breeze For Migrating Birds". New Scientist (2504): 21. 18 June 2005. Retrieved 6 December 2012. ^ Desholm, Mark; Johnny Kahlert (9 June 2005). "Avian Collision Risk At An Offshore Wind Farm". Biology Letters. 1 (3): 296–298. doi: 10.1098/rsbl.2005.0336. PMC 1617151. PMID 17148191. Retrieved 6 December 2012. ^ Welcker, J.; Liesenjohann, M.; Blew, J.; Nehls, G.; Grünkorn, T. (2017). "Nocturnal migrants do not incur higher collision risk at wind turbines than diurnally active species". Ibis. 159 (2): 366–373. doi: 10.1111/ibi.12456. ^ Bob Yirka (15 August 2012). "British researchers find geese alter course to avoid wind farm". Phys.org. Retrieved 6 December 2012. ^ Dalton, Andrew (7 December 2010). "Altamont Pass to Get Less-Deadly Wind Turbines". SFist. Archived from the original on 16 April 2013. Retrieved 6 December 2012. ^ "Critical federal approvals for massive Wyoming wind project". AP. 18 January 2017. Retrieved 29 October 2017. ^ "Federal Environmental Impact Statement for Chokecherry and Sierra Madre Wind Energy project". Bureau of Land Management, Rawlins Field Office. 3 July 2012. Archived from the original on 14 August 2012. Retrieved 6 December 2012. ^ McCoy, Janet (12 February 2016). "Auburn's eagles participating in Colorado wind technology research to help prevent bird strikes". Auburn University. Retrieved 29 October 2017. ^ a b Daly, Matthew (December 14, 2016). "Final wind-turbine rule permits thousands of eagle deaths". Associated Press. ^ "Caution Regarding Placement of Wind Turbines on Wooded Ridge Tops" (PDF). Bat Conservation International. 4 January 2005. Retrieved 2006-04-21. ^ "Effectiveness of Changing Wind Turbine Cut-in Speed to Reduce Bat Fatalities at Wind Facilities" (PDF). American Wind Energy Association. 2009-04-28. Retrieved 2009-04-28. ^ Aron, Jacob (2009-07-17). "Radar beams could protect bats from wind turbines". London: The Guardian. Retrieved 2009-07-17. ^ Nicholls, Barry; Racey, Paul A. (2007). Cresswell, Will (ed.). "Bats Avoid Radar Installations: Could Electromagnetic Fields Deter Bats from Colliding with Wind Turbines?". PLoS ONE. 2 (3): e297. Bibcode: 2007PLoSO...2..297N. doi: 10.1371/journal.pone.0000297. PMC 1808427. PMID 17372629. Lay summary – The Guardian (2009-07-17). ^ Morin, Monte. 600,000 bats killed at wind energy facilities in 2012, study says, LA Times, November 8, 2013. ^ "Wind Power Found to Affect Local Climate". ^ "Turbines and turbulence". Nature. 468 (7327): 1001. 2010. Bibcode: 2010Natur.468Q1001.. doi: 10.1038/4681001a. PMID 21179120. ^ Baidya Roy, Somnath; Traiteur, Justin J. (2010). "Impacts of wind farms on surface air temperatures". Proceedings of the National Academy of Sciences. 107 (42): 17899–904. Bibcode: 2010PNAS..10717899B. doi: 10.1073/pnas.1000493107. PMC 2964241. PMID 20921371. ^ Keith, David W.; Decarolis, Joseph F.; Denkenberger, David C.; Lenschow, Donald H.; Malyshev, Sergey L.; Pacala, Stephen; Rasch, Philip J. (2004). "The influence of large-scale wind power on global climate". Proceedings of the National Academy of Sciences. 101 (46): 16115–20. Bibcode: 2004PNAS..10116115K. doi: 10.1073/pnas.0406930101. PMC 526278. PMID 15536131. ^ MIT analysis suggests generating electricity from large-scale wind farms could influence climate — and not necessarily in the desired way MIT, 2010. ^ "Tourism blown off course by turbines". Berwickshire: The Berwickshire News. 2013-03-28. Retrieved 2013-10-08. ^ Young, Kathryn (2007-08-03). "Canada wind farms blow away turbine tourists". Edmonton Journal. Archived from the original on 2009-04-25. Retrieved 2008-09-06. ^ Zhou, Renjie; Yadan Wang (2007-08-14). "Residents of Inner Mongolia Find New Hope in the Desert". Worldwatch Institute. Retrieved 2008-11-04. ^ "Centre d'interprétation du cuivre de Murdochville". Archived from the original on 2008-07-05. Retrieved 2008-11-19. - The Copper Interpretation Centre of Murdochville, Canada features tours of a wind turbine on Miller Mountain. ^ Windenergie in Deutschland: Konstellationen, Dynamiken und Regulierungspotenziale Im Innovationsprozess, Bö Ohlhorst, Springer-Verlag, 2009, p.163, "Kritik an zunehmend industrieller Charakter der Windenergienutzung"
^ Dipert, Brian. Cutting the carbon-energy cord: Is the answer blowin' in the wind?, EDN Network website, December 15, 2006. ^ Rod Thompson (20 May 2006). "Wind turbine lights have opponents seeing sparks". Honolulu Star-Bulletin. Retrieved 2008-01-15. ^ New South Wales Government (1 November 2010). The wind energy fact sheet Archived 2011-03-20 at the Wayback Machine, Department of Environment, Climate Change and Water of New South Wales, p. 12. ^ Turbine goes up in flames Retrieved August 26, 2013. ^ Brown, Curt. Dartmouth Select Board OKs Permit For Two Wind Turbines, SouthCoastToday.com January 05, 2010. Retrieved February 8, 2012. ^ Major Offshore Wind Farm Fitted With Fire Extinguishers Archived 2013-01-26 at Archive.today, Infor4Fire.com website, August 19, 2011. Retrieved February 8, 2012. ^ Fire Protection For Wind Turbines: Safe For Certain – MiniMax, Minimax.de website. Retrieved February 8, 2012. ^ Aspirating Smoke Detector AMX4004 WEA For Wind Energy Plants: Cool Down Fire Protection By Minimax, Minimax.de website. Retrieved February 8, 2012. ^ Built-in fire brigade: water vs nitrogen; Dealing with fire is likely to become an increasingly hot topic for the wind turbine business, Modern Power Systems, May 1, 2007. ^ Wardrop, Murray (2008-12-04). "Wind turbine closed after showering homes with blocks of ice". The Daily Telegraph. London. ^ Brouwer, SR; Al-Jibouri, SHS; Cardenas, IC; Halman, JIM (2018). "Towards analysing risks to public safety from wind turbines". Reliability Engineering and System Safety. 180: 77–87. doi: 10.1016/j.ress.2018.07.010. ^ Rodmell, D. & Johnson, M., 2002. The development of marine based wind energy generation and inshore fisheries in UK waters: Are they compatible? In M. Johnson & P. Hart, eds. Who owns the sea? University of Hull, pp. 76–103. ^ Study finds offshore wind farms can co-exist with marine environment, BusinessGreen.com website. ^ UK Offshore Energy: Strategic Environmental Assessment, UK Department of Energy and Climate Change, January 2009. ^ Johnson, M.L. ; Rodmell, D.P. (2009). "Fisheries, the environment and offshore wind farms: Location, location, location". Food Ethics. 4 (1): 23–24. Alois Schaffarczyk (ed. ), Understanding wind power technology, Wiley & Sons 2014, ISBN 978-1-118-64751-6. Hermann-Josef Wagner, Jyotirmay Mathur, Introduction to wind energy systems. Basics, technology and operation. Springer 2013, ISBN 978-3-642-32975-3. NWCC. National Wind Coordinating Collaborative website, facilitated by the American Wind and Wildlife Institute, includes its updated summaries of wind-wildlife interactions from 2010.